Rock Springs, WY. (September 21, 2014)–-The public is outraged more indigenous wild horses are being rounded up and permanently removed from public land for the water and fracking land grab. Protect Mustangs is calling for protests to stand up for American wild horses and for a tourism boycott targeted at Wyoming who promotes “Roam Free” in their marketing yet ignores wild horses in their state. More than 800 Divide Basin, Adobe Town and Salt Wells wild horses are being rounded up from the public-private land known as the “Checkerboard” in southwest Wyoming. The Rock Springs Grazing Association (RSGA) took the Bureau of Land Management (BLM) to court to push the roundup through. 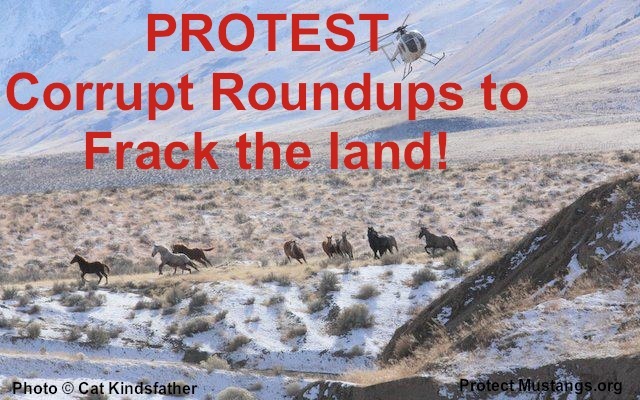 Wild horses are terrified by choppers, their families ripped apart, forced into inhumane captivity, be at-risk for going to slaughter and forever lose their freedom to roam and contribute to the ecosystem. Several wild horses have already died brutal deaths in the roundup–some victims were only a few months old. Field reports allege the BLM has inflated the population guesstimates to justify removals requested by the RSGA. There is no evidence of overpopulation according to the National Academy of Sciences’ 2013 report. 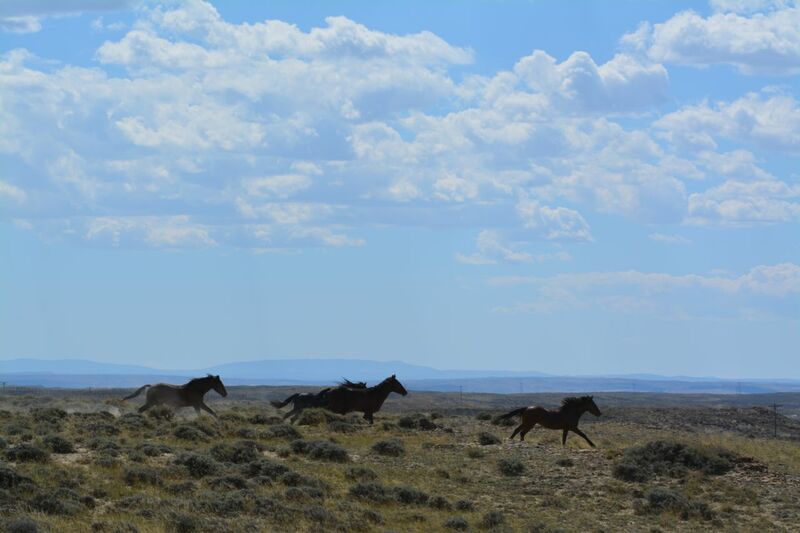 Protect Mustangs is calling for an immediate moratorium on roundups and removals for scientific population studies and holistic management. Advocates want to see genetically viable herds on public land but the BLM prefers to cater to the extractive industry who wants number so low wild horses will die off. 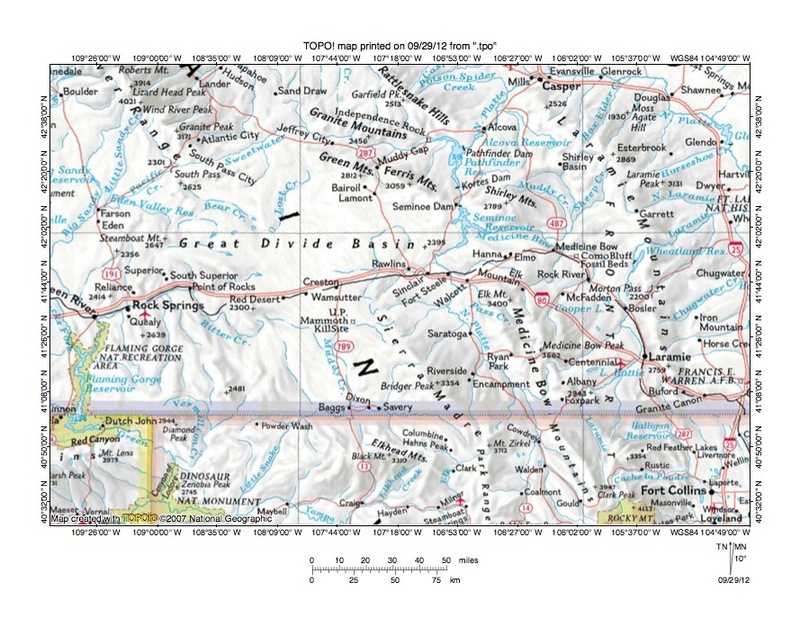 The Great Divide Basin, Adobe Town and Salt Wells Creek herd management areas (HMAs) total approximately 2,427,220 acres with approximately 1,2427,220 acres in the Checkerboard. The roundup held up in court recently due to the Rock Springs Grazing Association (RSGA) Consent Decree ordered by the U.S. District Court on April 3, 2013, to remove all wild horses from private lands within the checkerboard portion of the complex in 2013. The RSGA appears to be heavily involved with energy development. Members of the public are encouraged to watch GASLAND 2, contact their elected officials, peacefully protest the roundup and join America’s growing anti-fracking movement to stop the devastation of native wild horse habitat. Protect Mustangs is a grassroots conservation nonprofit devoted to protecting native wild horses. Their mission is to educate the public about the indigenous wild horse, protect and research American wild horses on the range and help those who have lost their freedom. Protect Mustangs is a national nonprofit organization who protects and preserves native and wild horses. Thank you for your comments they will be posted soon. This entry was posted in Uncategorized and tagged Adobe Town, Anne Novak, BLM, boycott, BP, Checkerboard, energy, gas, Gasland, gather, Josh Fox, LNG, Mustang, natural gas, oil, Peoples Climate March, Protect mustangs, protest, roundup, Salt Wells, Tami Hottes, tourism, wild horses, Wyoming by Protect Mustangs. Bookmark the permalink. Let the horses roam free! Stop this! We the taxpayer voted and had set aside land for these animals. Get the private cattlemen’s livestock off that land! Please save the last of our American history before they become “history” forever. That is their land and we as humans have the obligation to save them . They are an important part of our history, from giving us means of transportation, serving in the military and they deserving better. My daughter & I went to our first Mustang Makeover this past July at the Linn County Fairgrounds in Albany,OR and rlleay enjoyed it! We were amazed at what these horses learned in such a short amount of time! My daughter rlleay wants to participate in the teen program next year and work with a yearling! We were rlleay excited when we learned that they made a documentary about the Mustang Makeover and we’re hoping that they will show it here in Salem,OR! Please Protect these beautiful Horses!!! We have known that wild horse removal was about energy since the Ruby Pipeline info came out a few years ago. Fracking pollutes and depletes our water reserves. IIf they succeed in destroying our wild horses and fracking takes place, we will all perish in time. We must save the horses and the environment or will will pay dearly ourselves. How ironic, capitalism is totally Dependant on energy and will destroy everything in its quest. Mountain top removal, deep ocean drilling, fracking, tar sands, are all a result of this quest. What is ironic is as energy is depleted the one energy source that is totally renewable and served mankind faithfully for thousands of years is being displaced for no good reason except the greed of a few people. 500 years ago the people with horses conquered the people without horses. 100 years ago we had no oil and horses 100 years from now we will have no oil or horses. What the BLM has perpetrated on the wild horses, as well as on the land on which they lived, is in direct violation of their mission. They have sacrificed the public trust for the selfish and greedy interests of a few individuals. They MUST be brought to account for their heinous actions. What is happening in Wyoming with the removal of the wild horses is an abomination to America! Those perpetrating this crime and violation of the WFHBA are utter monsters! I visited this area in Spring 2013 particularly Adobe Town after having been given direction from plaintiff Lloyd Eisenhauer of Cheyenne and it was hard to find the few bands of wh’s remaining. The place was filled with fracking stations of many of the biggest companies in the world like Bechtel, Mobile Oil, BP, etc. The legal HMA was cris-crossed with roads for these mineral developers and the truck drivers eyed me warily as though I was a misfit here in the legal wh HMA to see the wild horses. Cattle-caused environmental damage was ubiquitious. What is happening in Wyoming is so wrong! We must change this situation. Those in power have become monsters without conscience! And liars! “It is irresponsible and false for Iron County commissioners or anyone to claim that the wild horses in that area are having a significant negative impact on livestock and wildlife as some local news releases have indicated,” stated Bob Edwards, Range Scientist and 30 year veteran of the BLM. “Having been well acquainted with these areas for over 25 years as a BLM employee, it is obvious that resource degradation has been and presently is mostly caused by livestock which have been historically allowed on these areas in excess numbers and duration. You are destroying everything for your greed! You will kill anything that gets in your way. We all know what Fracking the earth is doing. STOP IT.